This comic went up late because these people doing work on a tree a couple backyards away sort of half-knocked-over a phone pole (not a power pole) and tore a chunk of siding out of the house and the phone box was already falling out and basically it is just now working again. Rabid: You mean the figurine is a fake!? Rabid: ... "Assuredly so"!? That's all you've said for, like, a week!! Are you even CAPABLE of saying something else? Rabid: Can you DEMONSTRATE this ability!? Rabid: Well why don't you PROVE it by saying something ELSE!? Doesn't that sound good? Rabid: STOP IT!! JUST SAY SOMETHING ELSE!! 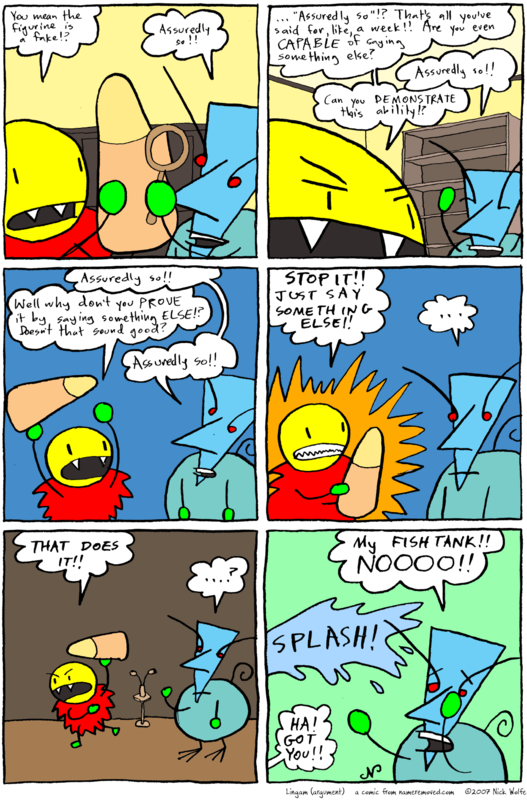 Dr Quickly: My FISH TANK!! NOOOO! !